In a perfect world, you'd try on a variety of watches to test which one looks the best on your wrist. However, ordering online has thrown a wrench in this plan. Now, buyers need to know which watch size works best for their style and wrist. You can download this watch sizing guide to determine which dimensions work best for you. This guide provides accurate dimensions for 24mm to 50mm watches. All you have to do is print, cut out a few watches, and try them on. To keep the dimensions accurate, print horizontally and do not scale. Rule #1: There is no perfect science to determining your watch size. The primary rule is to choose a watch size based on your own personal preferences. Some people like larger watches and other people like smaller watches. So long as you like the watch and how it looks on your wrist, you can ignore the rest of our rules. Rule #2: If you have an opportunity to try on watches, we highly suggest you do so. Once you try on a watch, your first instinct will most likely be correct. If a watch looks too small or too large, then it probably is. Rule #3: The lugs on the watch should not extend past the edge of your wrist. If the lugs jut out, then the watch will look disproportionate to the size of your wrist. If you’re not familiar with the term “lugs”, it’s the part of the watch that connects the case to the strap or bracelet. To make sure the lugs won’t extend past your wrist, you should measure the width of the top of your wrist. Then determine the length of the watch, and see if the watch will be compatible. From the Experts: Take a flexible measuring tape or a strip of paper and measure the circumference of your wrist. This will give you an idea of how your wrist stacks up against the average size. 1. Is the top of your wrist flat or round? This will affect how the watch sits on your wrist. You may not be able to use the circumference of your wrist as a stand-alone measurement. 2. A thicker watch will look bigger than a thinner watch. 3. If you purchase a leather or fabric strap, then it’ll make your watch look a bit smaller. 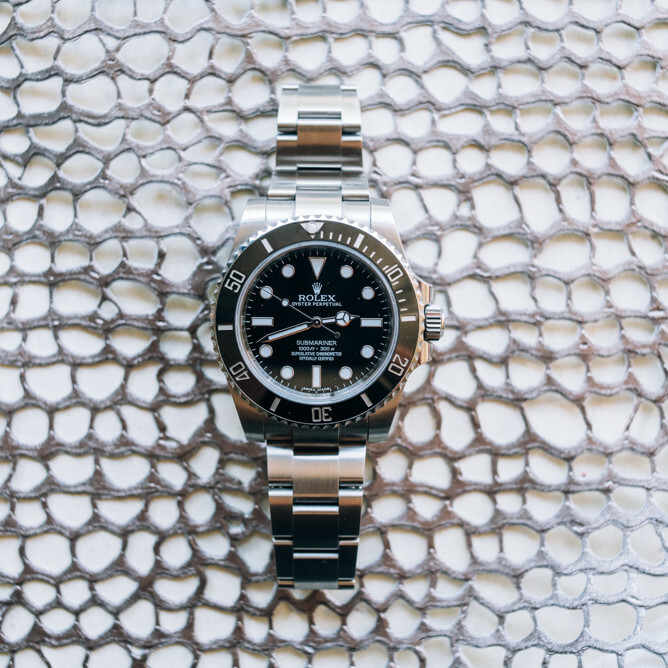 If you purchase a metal or ceramic bracelet, then your watch will look bigger. A thick bracelet may be better suited for people with larger wrists. 4. Not only should you evaluate the dimensions of the case, but you should also look at the crown and the pushers. Anything that sticks out away from the watch should be proportionate to the watch and your wrist size. Don’t have a chance to test out a watch before you buy it? Download our sizing guide to visualize how your watch will fit. Simply print the page, cut out the watch image, and try it on. Still not sure which watch size is best for you? Check out the article "How Should a Watch Fit" from The Hour Glass.